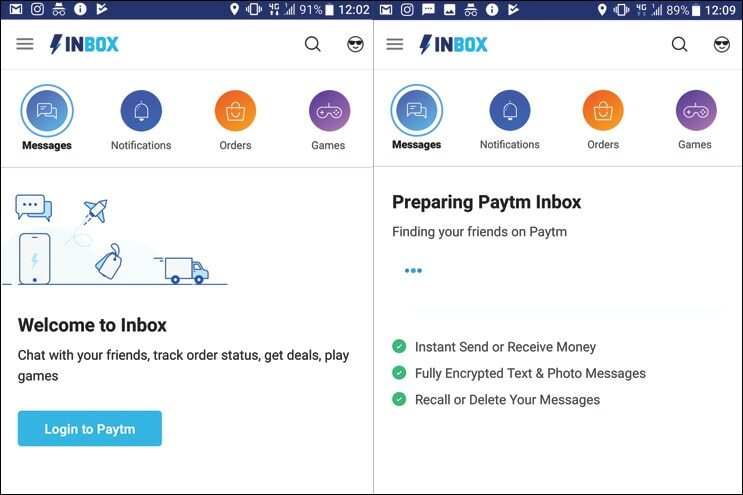 While WhatsApp is still doing a beta test for its in-chat payment feature, the digital payment service provider Paytm on Thursday has announced the launch of its chat platform Inbox. It will allow user to transact funds along with exchange of texts, videos and location from within the chat window. “We are excited to launch Paytm Inbox today, a new offering on our app with a fast and simple messaging service that will let you chat with your friends and family, and send/request money at the same time. You can even chat with your friendly neighborhood shopkeeper and order stuff easily and send them money instantly on delivery,” company announced on its blog. Paytm says that Inbox is encrypted end-to-end. Also, the chat serivce will have an in-built camera to allow users to share images and videos with their contacts. Paytm Inbox is available for Android users since Thursday with iOS users to get it soon. The messaging app comes with Delete for All aka recall button, a feature that recently debuted in WhatsApp. Though the name of the feature is similar, but there’s one big difference between the two. The WhatsApp’s recall feature is time-sensitive, meaning messages sent within 7-minutes can only be recalled. With Paytm Inbox, there’s no time limit. ” We understand you may send something by mistake. You can recall a message?-?whether to one person or a group by using the ‘Delete for All’ option. The good news is, there are no deadlines for this to work!”Apart from this, the Paytm Inbox comes with Notifications, Orders and Games. Notification shows the cashback offers across all categories, Orders lets the user view the status and transaction update of any order and lastly there is Game. — Update your Paytm from Play Store. — Once updated, you will see an Inbox button at bottom of the page, on the left of Bank. — Tap on Inbox and you will now see all your contacts who are already available on Paytm Inbox. — Tap on the contact you wish to chat with and start chatting.